Logan County 4-H will have a "Bugs and Butterflies" mini camp on Thursday morning, June 20, from 8:45 to noon at Kickapoo Creek Park in Lincoln. Logan County 4-H’ers and their friends who are 8 years and older are welcome to attend and join in the morning’s bug and butterfly-themed activities. Cost for the mini camp will be $3 per person (payable that morning). Participants should plan to arrive at the park sometime between 8:45 and 9 a.m. Youth will participate in making bug catchers, spider/butterfly gliders, and bug and butterfly pencil toppers, as well as making butterfly snacks and going on a nature walk to collect bugs. To register for the "Bugs and Butterflies" mini camp, please contact Patty Huffer at the Logan County Extension office, 732-8289, for a registration form. The deadline for registration is Friday, June 7. CIEDC’s corporate board met March 21 for its annual meeting, and officers were elected. They are Paul Gleason, president; Gaila Barcus, vice president; Steve Waterworth, secretary; and Mike Booher, treasurer. Following the board meeting, nearly 120 people, including board, staff and friends of Community Action, attended a dinner and program at Lincoln’s Moose Lodge. Guest speaker Vincent Clark, executive director of Kankakee County Community Services, related Community Action’s work to the biblical story of the beggar at the Gate Beautiful. He praised those who had given of their time and resources over the 35 years of CIEDC’s history. Awards were presented to outstanding volunteers and donors, and special recognition was given to Joyce Coleman. Joyce recently retired from the CIEDC staff due to illness. Her service to CIEDC spanned more than 30 years and included a term as board member, many hours of volunteer service and employment in several of CIEDC’s programs. Statewide recognition was given to the 30th anniversary of the Senior Nutrition Program funded under the Older Americans Act. CIEDC acknowledged Ruth Stewart, Peggy Hamblen and Tillie Davidson in recognition of their many years as program participants. At the annual meeting each was presented a certificate signed by Gov. George Ryan and Margo Schriber, former Community Action director and now director of the Illinois Department on Aging. The Master Gardeners of Logan County are undertaking their first major event of the season. Saturday, June 8, garden enthusiasts will be given the opportunity to tour eight of Lincoln’s most attractive gardens. On the tour are the perennial garden on the south side of the Extension office at the Logan County Fairgrounds, the "Children’s Gardens" just north of Jefferson School on Sixth Street, Mary and Jerry Moore’s garden at 121 Carter Lane, Pete and Dixie Ross’ garden at 1430 Delavan St., Dr. Don and Jan Sielaff’s garden at 135 Tenth St., Bob and Jody Graue’s garden at 4 Meadow Lane, Sarah Jacobs’ garden at 326 Park Place, and Bob and Lynn Neal’s Scully Estate gardens. The tour will be from 10 a.m. to 4 p.m., rain or shine. Tickets are $8 each and are on sale at State Bank, Logan County Bank, CEFCU, Union Planters Bank and the Extension office. Make plans now to attend, and ask your neighbor to tour with you. A new Master Gardener class will begin in September at the Logan County Extension office. All classes are taught by specialists and professors of the University of Illinois Department of Agriculture. • For those of you who don’t enjoy working out in the summer heat, we encourage you to join us for aerobics. All of our classes are in a private, air-conditioned room. We will even let you use our showers so you can leave after your workout as fresh and clean as when you came in. Aerobics schedules with class descriptions on the back are available at the front and back desks. If you have any questions, call us at 732-8770 between 8 a.m. and 10 p.m. Monday through Saturday. On Sunday our office staff is available from 10 a.m. to 10 p.m.
Two young men from Logan County were honored by the Lincoln Rotary Club recently for the skills and attitudes they’ve demonstrated, indicative of success in the "real world." Hans Bishop and Daniel Coers were honored as recipients of the Ready for the Real World Award. This is the fourth year for the award created by members of the Lincoln Rotary Club to honor those youth who have started their own businesses or demonstrated maturity above and beyond the expectations for a teen employee. 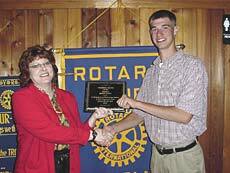 Olympia graduate Hans Bishop was recognized by the Lincoln Rotary for his entrepreneurial skills. As part of his 4-H woodworking project, Hans has built and sold birdhouses. He even has a website to market his goods and has successfully dealt with "real world" business challenges like dealing with the changes presented by the corporate merger of his website host. Hans was nominated by Patty Huffer of the University of Illinois Extension office. Hans will begin a job at State Farm Insurance as he also pursues studies at Heartland College. 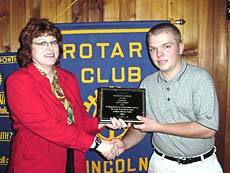 Hartburg-Emden graduate Daniel Coers was also recognized as an exceptional young employee through the Lincoln Rotary Ready for the Real World program. He was nominated by Jim Klokkenga of Emden. Coers has been employed by Klokkenga’s swine and crop enterprise for more than two years. Klokkenga noted that Daniel takes extra-special care of all equipment, both old and new. And, that level of care and consideration is hard to find in any farm employee. Coers plans to continue working for Klokkenga Enterprises as he begins studies at Illinois Central College this fall. Each of the two young men was presented with a plaque and check for $250 from the Rotary Club. Join us Thursday, June 13, at 11:30 a.m. for the monthly luncheon with grilled hamburger and hot dogs. Bring a dish to pass or a $3 donation. If you need a ride from Hartsburg, Emden or the Friendship Manor in Lincoln, there are still a few seats available on the van. Call by 9:30 a.m. For $5 you can ride and have lunch. Stay for bingo (only 50 cents), sponsored by The Oasis, from 1 to 3 p.m. or shop until 2:45 p.m., with a return ride home starting at 3 p.m.
Join the fun with pinochle, 5 in 1, billiards and a potluck dinner this Friday, June 14, starting at 6 p.m. Bring a dish to pass and stay for the games. Winners for the past weekend games were Esther Will for pinochle, Bernie DePuy and Louise Wiebers for 5 in 1, and Alice Thornton for pool. Sunday night Ann Greger won rummy honors. Daytime pinochle winners were Madeline Moore and Henry Warnisher. Monday, June 17, starting at 1:30 p.m., join us to celebrate June birthdays — yours or your friends’. We will have games, lots of fun and birthday cake. No reservation is needed. Join us from 1 to 2 p.m. Tuesday, June 18, for the resumption of this support group. A certified Alzheimer caregiver, Georgina Tisdale of Maple Ridge Care Centre, will facilitate the group. Whether you are the primary caregiver or know someone who needs more information about Alzheimer’s disease, please join us. No reservation required. BE A SAFE CANNER! It is once again time to get your canners out and have your dial gauges tested so you know they are safe and accurate in time for canning green beans, etc. Weighted gauges do not need testing each year. University of Illinois Extension has reserved June 13 for you. You may bring your canner to the Extension office on the northwest corner of the Logan County Fairgrounds on or before the 13th. Tested gauges will be ready for pickup by 4 p.m. that day. If you have questions, call 732-8289. [MAY 20, 2002] For politicians and elected officials, awards, honors and recognitions are an everyday occurrence. Such people are used to accepting and giving letters, plaques and ribbons in honor of this or that success. But it is not every day that a normal citizen of a small town like Lincoln gets recognized for his commitment and achievement. Sensei Dan Dugan is a fifth degree black belt in Chito-Ryu karate. He holds the title of Godan, or master instructor. Saturday, under the pretense of attending a friend’s anniversary party, he was taken to the Depot for his own surprise anniversary celebration. Dugan has been involved in Chito-Ryu for 30 years this month. His students awarded him with a plaque commemorating his 30 years and a photo of Dr. Chitose, the inventor of Chito-Ryu. Dugan has been an influence on many people in the community. His students have received direct influence, both over their physical health and their maturity and devotion. Dugan’s son Todd, who teaches social studies at Lincoln Junior High, was also one of his dad’s students. He says that he was highly influenced by his father. He believes it was his father’s impact that made him decide to teach. Dan Dugan has been an inspiration to his students, his children and his community. Congratulations, Sensei. May you have 30 more years in your art. [MAY 23, 2002] Abraham Lincoln Healthcare Foundation is presenting the eighth annual FORE-ALMH golf outing on Friday, June 28, at the Lincoln Elk’s Country Club golf course. The format for the event, which is open to the public, is a four-person scramble with a morning and an afternoon shotgun start. The $75 entry fee includes greens fees, cart, lunch and opportunities to win great prizes and awards, including hole-in-one, top foursomes, and longest putt, longest drive and closest to the pin for both men and women. Proceeds from the event benefit the Care-A-Van non-emergency transportation system of Abraham Lincoln Memorial Hospital. The Care-A-Van is a specially equipped van, custom-built to provide transportation for individuals who are confined to a wheelchair or need transportation assistance to necessary appointments. Last year over 140 players participated in the outing, which raised over $11,000 for the Care-A-Van. For registration and sponsorship information, please contact Cynthia Kelley at the Abraham Lincoln Healthcare Foundation, (217) 732-2161, Ext. 405. Lincoln native George A. McKinney, a contributor to the LDN Diaspora section, has a new e-mail address, okihanna3@sc2000.net.